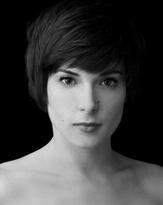 Ashley Frances Hoffman began her dance training at the age of 11 at the School of the Salt Creek Ballet near Chicago. She continued her studies at the Virginia School of the Arts and Indiana University. In 2005, Hoffman was invited to perform in Switzerland with Cinevox Theatre, and continued to work with various contemporary choreographers until 2007. Since returning to the U.S., she has danced with the Los Angeles Ballet and appeared as a guest artist with several regional ballet companies, dancing international repertoire. Ashley was a 2008 Horton Award nominee for Outstanding Achievement in Performance – Small Ensemble – for her work with Francisco Martinez Dance Theater. Currently, as well as performing with Monat Dance, Ashley is a founding member of Luminario Ballet where she has worked with Doriana Sanchez, Evelyn Cisneros, John Pennington and Alexander Magno.